In the third and last game of the local tournament, Capitol Bash I, I played against another army of Elves, commanded by Glen. His armies are always created with the use of Mantic models only and his Elven force was no exception. 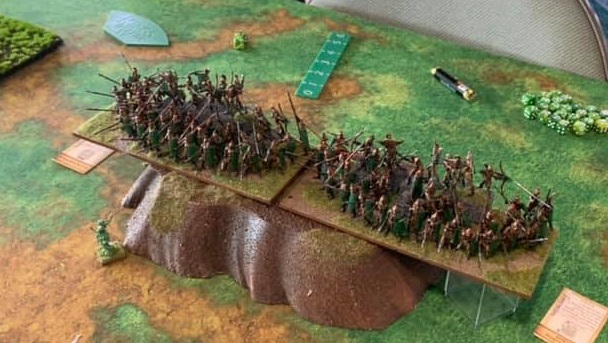 The army itself was also designed in a completely different way as it was based around horde units and had a few units that I didn't have in mine. Here are the details of the army Glen brought to the tournament, with the exception of artifacts that I, unfortunately, cannot recall at this stage. - Bolt Thrower (BT1), War Engine, Blast (D3), Piercing (2), Reload! After a month or so after CanCon 2019, I participated in another Mortem et Gloriam tournament. This time it was organized by Andrew in Campbelltown near Sydney. Luckily for me, there were a few players from Canberra planning to attend as well. Dean was kind enough to offer me a lift to and from Campbelltown. The journey definitely passed faster when discussing all things related to Mortem et Gloriam! The tournament was organized at the shop called Hall of Heroes. 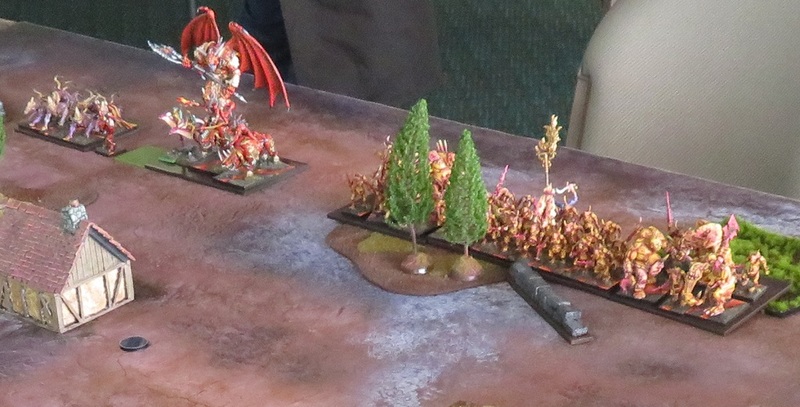 It was open format and armies had to be at 10,000 points per side. 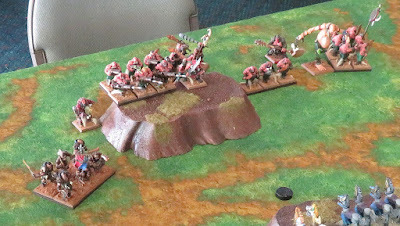 There were 15 players attending and there was an interesting mix of armies present. In the second round of the local tournament, Capitol Bash I, I played against Nick who commanded beautifully modeled and painted army of Forces of the Abyss. I often wish I had more time in between the games or even a period long enough to show armies on display. Simply to wonder around and admire people's armies. This was such a case and I do hope to see Nick's army in action more often! Forces of the Abyss is the foundation type of a faction for world of Mantica and I am glad to see it being represented. I have not had many opportunities to play against it and more importantly, I finally had an opportunity and great pleasure to play against Nick! In the second practice game prior to the next event I had a great pleasure to play against Dean from Olympian Games. Dean usually organizes tournaments for Mortem et Gloriam enthusiasts but this time he was to participate one. And needed a sparring partner to test his army. I was happy to accept the challenge! Last time we played against each other Dean had great looking Parthain army. However, this time he brought the force of French Ordonnance. I have never had an opportunity to play against it but I expected similar units to those I fought against in 100 Years' French armies. 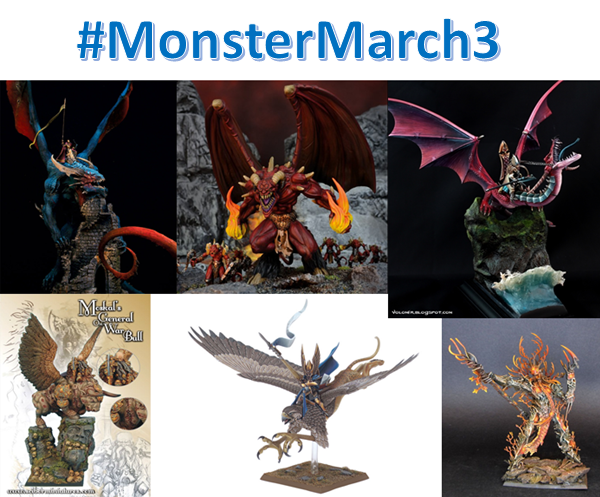 Welcome to the final post about Monster March 3 painting and modelling challenge! In the final post I will once again present the participants and the projects they pledged this year. But before I do this I would like to thank all and each one of the participants for your contributions. It goes without saying that the challenge would not be what it is without you. Thank you so much! It was absolute pleasure to host it for you again and as before, I am always amazed and inspired by all of you! I must admit I had a bit of a doubt if I can host it this year. However, when Ed asked me if there is going to be Monster March this year, I cast my concerns aside and said yes! I realized that this is what I need to do especially when real life interferes and it seems that spare time is shrinking and shrinking. It is amazing, however, how committing to such project helps to find time and organize other activities accordingly. I am really happy I did not give up and without further ado, here are the participants and their final projects for Monster March 3! After a few games online on Universal Battle 2, I have had a good opportunity to play with real models again. We had a small, local tournament organized by Tas - Capitol Bash I. There were only 7 of us participating. I think it was just unlucky coincidence that many regular players could not attend this time. The event was organize more as a relaxed group together so we did not use chess clocks. There were three rounds, armies were at 2250 points and Black Jack scoring system was used. The factions represented were: 2 x Ogres, Trident Realms, Kingdoms of Men, Forces of the Abyss, 2 x Elves. In the first round I was about to play against John and his Ogre army. I have never had a chance to play against John before so I was glad we finally had an opportunity to do so! 6 Shooters (B), Large Infantry, Horde, Heavy Crossbows, Crushing Strength (1), Piercing (2), Reload! There was not much time to rest after CanCon as there was another tournament coming in one month. Those who considered participating needed a bit of practice again, if only to get back to the armies at 10,000 points. Trimming down the existing forces by 500 points seemed to be a dilemma for all of us. It was thus great that Paul was ready to play early. What is more, he needed an immediate rematch after our game at CanCon when we got to play each other in the last round.